NATURAL HABITAT AND PREFERRED SITE: Prickly ash is normally found along hedgerows, in thickets and on edges of forests in east Texas but also spreading farther west. This interesting little tree is adapted to a wide range of soils and prefers full sun. According to Benny Simpson it is a tree of the Blackland Prairies, Pineywoods, Gulf Prairies and Marshes, and of the Post Oak Savannah. It likes deep heavy alkaline clay soils but will also grow in the almost sterile sands. It shows up the most often on the wood’s edge or fencerows where the seed have been planted by birds and other wildlife. ​​Also grows in New Mexico, Arizona and Nevada. IDENTIFICATION INFORMATION: It is a shrubby small tree that rarely grows over fifteen feet. 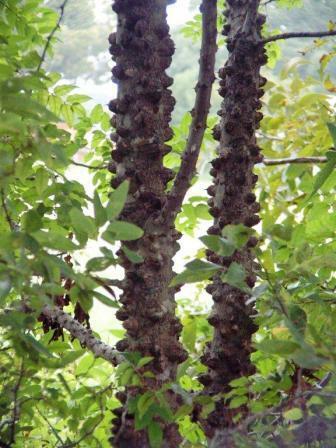 The bark is gray white with corky-based nasty spines or thorns on the trunks and stems. It has very light lacy foliage. FLOWERS AND FRUIT: The flowers are small yellowish green on the female plants in clusters in the spring. The fruit is a brownish follicle containing a single seed that ripens from mid to late summer. BARK: The bark is the most distinctive feature. It is smooth, has mottled light and dark spots and dramatic spines that are very wide at the base. FOLIAGE: The foliage is compound, alternate and each leaflet is lance shaped and aromatic. 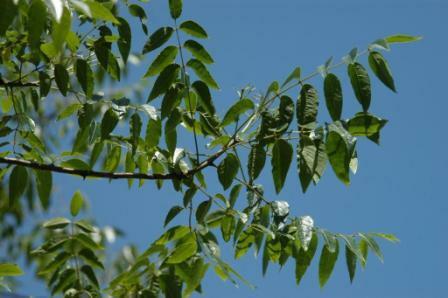 CULTURE: Prickly ash is very easy to grow in most any soil. Not recommended heavily for planting but is easy to keep alive if existing on site. PROBLEMS: The foliage gets eaten by caterpillars, but the caterpillar that loves the foliage is the giant swallowtail so care should be given to protect these beautiful insects. PROPAGATION: Can be done by seed or cuttings. The seed germinate in twenty to forty days and can be helped by soaking in liquid seaweed or Garrett Juice and giving cold hours at about 41 degrees or so for 30 days. Prickly ash can also be propagated by root cuttings taken in the late winter. Cut roots into links approximately one inch long and place horizontally in potting soil. Moisten and cover with paper until growth begins. If protected through the winter, the plant should grow well in the spring. INSIGHT: All parts of the tree including the bark will numb the gums and tongue when chewed or sucked. 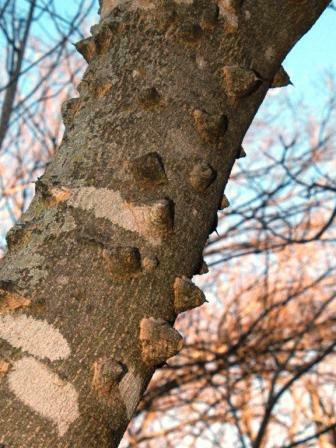 Native Americans used prickly ash or tickle tongue tree as a painkiller. Native Americans chewed the bark for toothaches and drank berry tea for sore throats. The bark and berries are stimulants and have been used historically to treat digestive problems, rheumatism, skin diseases, nervous headaches, varicose veins and congestion. Prickly ash provides cover for wildlife and the blooms help to make a delicious honey. NOTES: Trees produce a large amount of bright red berries in the fall. In China the dried, roasted berries of similar species of Zanthoxylums are used as the main ingredient of Sichuan seasoning. The ripe berries are picked and dried until they split open revealing dark seeds. The husks are coarse ground after seeds removed for use in many Chinese recipes. The husks can also by dry-roasted in a frying pan for a richer smoky flavor. The numbing aspect of the berries tempers their spiciness into a unique flavor.